Fans of veteran BBC radio presenter Dave Cash, who died last year at the age of 74, have begun a petition to have a Kent roundabout named after him. The former Radio One DJ from Hollingbourne used the roundabout and often mentioned it on Radio Kent. Anne Bond, from London, who started the campaign, said his "loyal listeners" would like to remember him by naming Junction 8 on the M20 Dave Cash Corner. Her petition will be presented to Maidstone MP Helen Grant. Ms Bond said: "Dave used this roundabout on a daily basis, whether it be on his journey to BBC Kent or heading in and out of Maidstone. "Dave would always ask his travel reporter towards the end of his programme, whether the route to J8 was clear as his home was approximately a mile from the junction. He would often be spotted at the roundabout driving his branded 4x4." She described Mr Cash as a "national treasure" who would be sorely missed. She said: "We feel that to rename this roundabout would be one of the many ways we can remember Dave Cash for years to come." 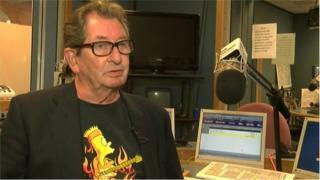 Mr Cash celebrated 50 years of broadcasting in 2014. He worked at Radio London and Radio Luxembourg before becoming one of the first DJs on BBC Radio 1. For the past 17 years he presented vintage chart and country music programmes on BBC Radio Kent and other BBC radio stations in the South. 1973 - He is hired as production director and presenter at fledgling Capital Radio where he was reunited with his former pirate radio partner Kenny Everett, reviving their popular and anarchic Kenny and Cash Show. He spent 21 years at the station.